Premium 100% Genuine Leather and high quality lock, very sturdy , strong lock, and durable. Use widely and conveniently. Simple strap design, connect your bag, purse, wallet, keys etc. and set your hand free. Also can connect to Name Tag Badge Holders etc. Right size, Multi-function, Perfect match for wallet,key, phone, etc., Also good keychain. come in handy. Great Colors to Match well with your bag/purse/wallet etc. Black/Red/ White/ Blue/coffee/ Rose red/Green/Gold, various bright colors wrist strips , well made and match very well with your bags/purse/wallet/outfits. 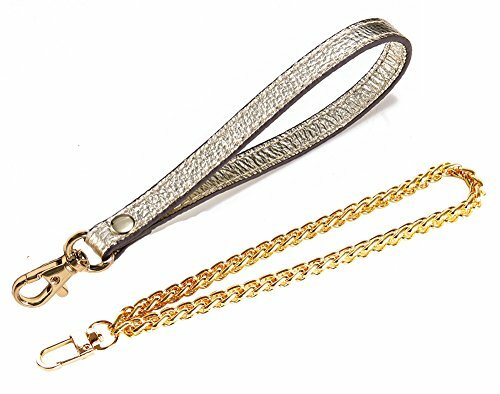 ❤Excellent 2Pcs Wristlet Strap KeyChain: Premium 100% Genuine Leather and high quality lock, very sturdy , strong lock, and durable. Use widely and conveniently. 2Pcs different strap to change different style with different Wallet or different use. ❤ Multi-function & Matches very well: turn a small shoulder bag into a wristlet, or make a wallet into a wristlet, and Great hand / Wrist strap for wallet, bags/ handbag, phones/Cameras/USB Flash Drives, Name Tag Badge Holders or other portable Items, etc. ❤Perfect fit and very well made. Nice Wristlet Strap Great to replaces the original old strap. Hook it onto your wallets and keys , carry them around with ease. Works great, Matches accessory and appears elegant. ❤Genuine leather, Sturdy, comfortable and fit nicely. Great quality and a great clasp strap for clutch. Great and strong hardware. ❤Perfect for everyone: Right size, Multi-function, Perfect match for Wristlet, Clutch, wallet,key, phone, etc., Also good keychain. unleash your hand, come in handy. If you have any questions about this product by UTreers, contact us by completing and submitting the form below. If you are looking for a specif part number, please include it with your message.